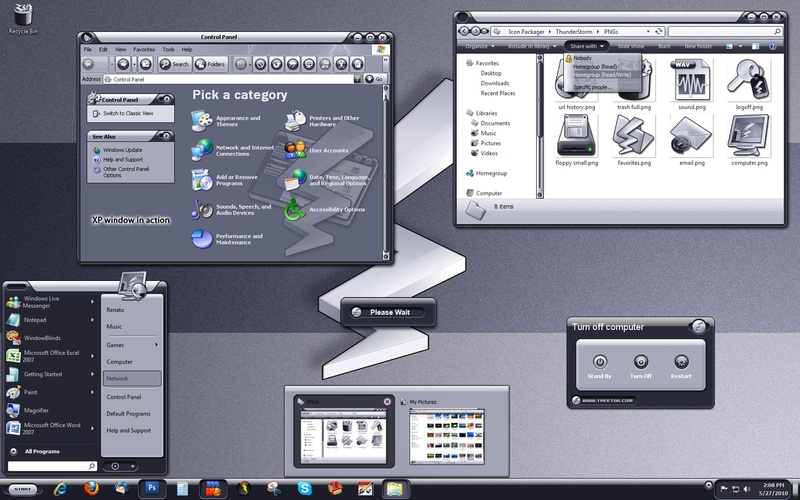 *UPDATE* Now complete skin for XP, Vista and Win7. To have more Thunder Storm Skins (IconPackager, CursorXP, Rainlendar, Sysmetrix,etc..), go to the appropriated sections. Have Fun! Like always, treetog your work is truly outstanding! Unbelievable. You've been saving this one up, huh treetog? I've always loved your workthis is some of your best. I look forward to more of this kind of material! Sorry to ask, but can you provide us with a link for the Wallpaper? Thanks!! dieselino gino 69: all the matching files are already uploaded over win customize in the appropriated sections. Again treetog ....this is truly great....I love it sdo much.. This is a great First Skin for the 2004 GUI Olympics, Thanks Treetog for Getting us off to a impressive start. Not my style but still looks great. Keep up they good work and hope to see another from you. Wow! I can't say more than that!! Hehe, you're the first one to upload, it's an omen ... a big clap of thunder !! This is definately a way to start things off...I really like it. Icons are excellent too! Fantastic work Treetog. This is jsut amazing...using it now and dont plan to change it soon. The bar has been set! Great work treetog! Great skin...my only disappointment is that the mouseover on the favorites -down menu in IE6 is black with black text. I know this is a known issue...but the Pixtudio YellowAlien skin avoids it by using a yellow mouseover trimmed in black. Maybe a gray mouseover trimmed in black would have worked here. little _tigger: I am sorry, because I don't know how to fix that, since here the icons are perfectly aligned to the systray. Does anyone else is having this problem?